mainly for carpets and industrial cloths. to see both the processes involved and the products. 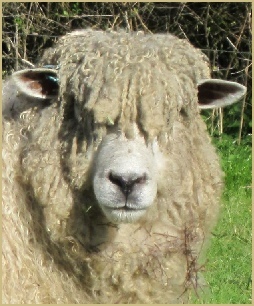 historical pedigree of Cotswold wool has been ignored as irrelevant. widely used to puff the influence of wool in the area. But what sort of wool was it that they prized so highly? and indeed of all the English long-wool breeds. mould: there is very little extant medieval woollen cloth available for analysis. way with the taxes levied on the trade. important to the medieval weavers? be drawn as fine as silk. nobles with flowing, draping cloaks to wear over their shirts of soft, fluffy merino. our day have long been a long-woolled race and valuable... for their wool. makes splendid block-weave rugs, is certainly an ideal candidate. Long live the Lion of The Cotswolds.